Braidot and Cicli Olympia, an ongoing story. 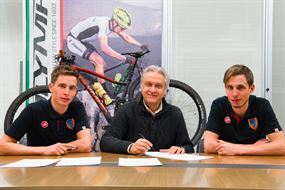 On Tuesday 6 February, at the Cicli Olympia headquarters in Piove di Sacco, brothers Luca and Daniele Braidot signed an agreement with the company's top management that confirms three years’ sponsorship for the twins from Gorizia by Cicli Olympia and Vittoria. These two historic sponsors have believed in these two cyclists who ride for the Centro Sportivo Carabinieri since they began competing in top-level off-road races as young hopefuls. The outcome is more than just a sponsor-athlete relationship, having become constant collaboration in pursuit of technical perfection and consequent improvement of racing results. The Braidot brothers’ career so far, studded with blue and Italian championship jerseys and even a seventh place by Luca in the Rio Olympics, has always seen Olympia and Vittoria as the common denominator. No surprise then that these two brands are firmly at their side on the journey that leads to the 2020 Tokyo Olympics, focused on participation by both brothers in the cross-country race. Daniele and Luca Braidot’s Olympia F1-X bikes are fitted with electronic Shimano XTR, Fox Float forks and Vittoria Reaxcion wheels.